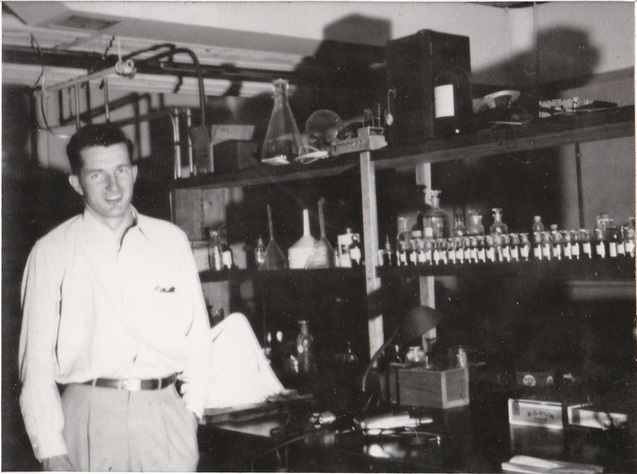 Dr. William E. "Bill" Haines in 1957 opening his new testing laboratory in Clearwater, FL. precision, efficiency and standardization throughout his laboratory, Dr. Haines created a unique method of standardizing solutions, making the process faster, easier and more accurate than traditional methods. He named these conveniently packaged single use bottles, Standardette® Solutions. Dr. Haines then established Chemical Standards Laboratory and began producing Standardette® Solutions for use in laboratories throughout the world. Since 1961, Standardette® Solutions have made the process of standardizing solutions faster, easier and more accurate. Standardette® Solutions have improved laboratory processes for manufacturers of foods, beverages, chemicals, forest products, electronics, cosmetics, fuels and many other industries. Standardette® Solutions will enable you to improve your laboratory processes too!